To ensure safety both on domestic and international flights aviation security control is conducted. All passengers (both point-to-point and transit), their hand luggage, baggage and personal belongings are subject to aviation security control. Passengers who have not passed aviation security control or not submitted their hand luggage, baggage and other personal belongings to be screened, are not allowed to board the aircraft. In the event a passenger has doubts whether to take or not to take any item, a thing or an accessory aboard, the information can be checked over phone: +380 63 980 64 38. Put all your belongings (bags and special containers) onto a conveyor and wait to be invited to go through a metal detector. Following these guidelines you will easily pass the aviation security control and spend more time on Duty Free shopping. 1. Flare pistols, signal lights, powder actuated fastening tools, gas cylinders containing neuro-paralytic, SC, toxic and potent agents. 2. Electric shock apparatus of all kinds, except for medical resuscitation equipment (defibrillators). 3. Cathodic weapons of all kinds. Fireworks and other pyrotechnics fireworks: rockets and signal lights, hand flares, smoke-generating cartridges, replica or imitation explosive devices, lighting cartridges, thermite matches, bomb matches, railroad firecrackers, Bengal lights, improvised pyrotechnics and similar articles. 5. Compressed and condensed gases designed for household and industrial use – propane, butane, nitrogen, neon, argon, oxygen, chlorine, except those carried by medical teams and used for emergency medical care. 6. Inflammable liquids: gasoline, kerosene, acetone, methanol, methyl ether, brake fluid, carbon disulfide, ethers, organic solvents, all types of adhesives and sealants containing inflammable (hypergolic) components. Brucine, nicotine, strychnine, formaldehyde, antifreeze, ethylene glycol, mercury, cyanide agents, cyclone, calcium cyanide and substances with similar properties. Chemicals designed to remove varnishes and coloring matters. 10. Radioactive substances and materials of any degree of potential risk, supply form, consistence and physical properties. 11. All other substances, molecular entities and articles similar to those listed above as well as articles and substances either requiring special storage, transportation and usage conditions or casting doubts on carriage safety such as those that can be either used for detonation and arson or endanger life and health of passengers, crew, and aircraft. 1. 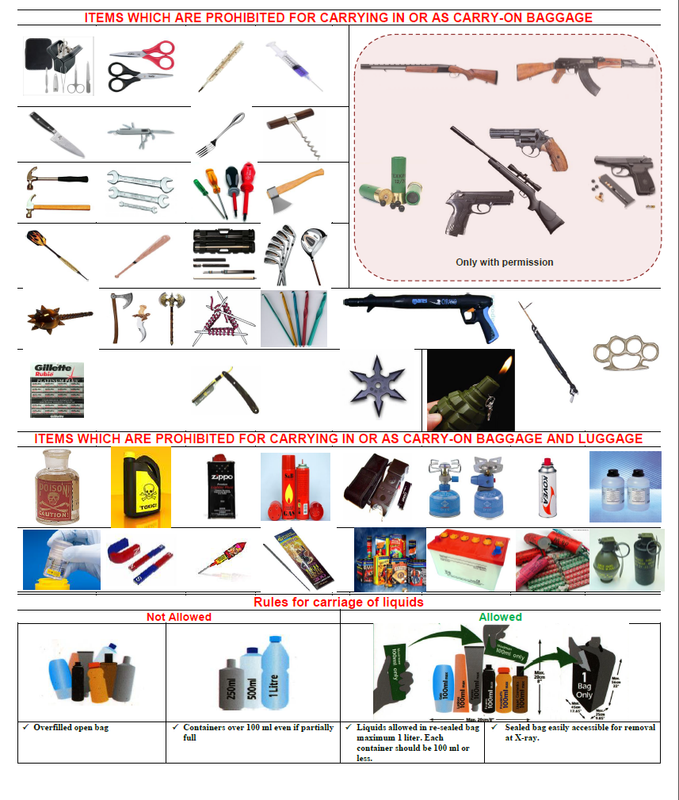 Firearms (including military, hunting, and sporting equipment), air guns, gas spray guns, pistols and revolvers designed to fire cartridges and equipped with rubber or similar balls, melee weapons of all kinds and similar articles, bullets and spare parts for weapons, as well as practice, emasculated, souvenir, collectible and fake weapons in case a private of juristic person presents the permission to store, bear and transport weapon, as well as shotguns and spear fishing equipment. Transportation of weapons is regulated by instructions approved by the central executive transport body. Toy guns, replicas and imitation firearms capable of being mistaken for real weapons. Medicines and special dietary products e.g. baby food. Other articles of similar consistency. Medicines and special dietary products (e.g. baby food) in hand luggage. Attention! A passenger must present a document confirming the need for diabetic medications and drugs to be used during the flight (this requirement applies to flights departing to the EU countries, USA, Canada, Norway, Iceland and Switzerland). Gas spray guns and revolvers owned by enterprises, institutions, organizations, business unions and citizens. Given that during the flight neither passengers nor crew have access to these articles. At the check-in counter passengers traveling within Ukraine and carrying of firearms, air guns, melee weapons and ammunition are required to present permissions to store, bear and transport weapons/ copies of weapon acquisition permits with a marketing note for each unit carried. The document must be issued by the relevant internal affairs authority. We advise you to inform your carrier on your intention to carry weapons on board the aircraft well in advance (if possible, do it when booking your ticket). In case you intend to carry weapons abroad, make sure you are well aware of the local traffic in arms regulations. Carriage of medicine and dietary products in the cabin baggage should be approved by the airline representative beforehand. The passenger who needs to have some medicine (or injection) during the flight should provide the information to the airline representative and also obtain the information as to the necessary medical references to be provided before the flight. The medicine (including those in the syringes or in other injection means) is allowed in the cabin baggage in case it is essential for the passenger, e.g. insulin, antihistamines, painkillers, etc. The necessity and the amount of the medicine should be pointed out in the doctor’s reference and confirmed by the doctor’s stamp. Passengers with babies may carry the baby food in the cabin baggage in quantity enough for the whole journey. During the security screening the passenger possessing the medicine in the cabin baggage (including those in the syringes or other injection means) should inform the aviation security personnel about it and submit the corresponding medical reference. The airline representative approves the carriage of such items in the cabin baggage. After the approval of the airline representative and successful aviation security control the passenger is allowed to board an aircraft. Depending on the health ability of the passenger (availability of the medical references) the airline representative has the right to deny or to allow the carriage.